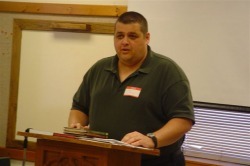 Lee Warren has taught workshops at various writer's conferences around the country, including the Florida Christian Writers Conference, Glorieta Christian Writers Conference, CLASSEMINARS Christian Writers Conference and the Heart of America Christian Writers Conference. What's the Deal with Style Guides Anyway? If you are a retailer, Lee is also available to do short presentations in your bookstore that are related to his books, followed by a book signing. He loves to do presentations about Christmas traditions, the single life, and athletics. If you'd like to talk to Lee about leading workshops at your writer's conference or about bringing him to your retail store, please contact him.